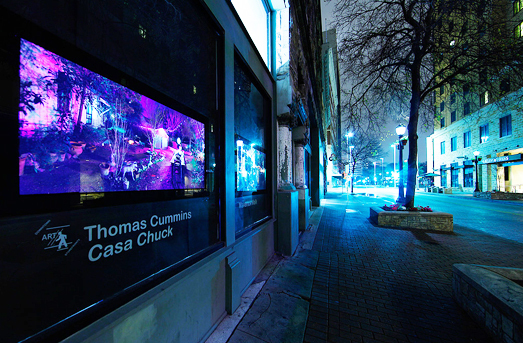 Thomas Cummins in 132 E. Houston St.
X MARKS THE ART (2011-2014) aimed to activate underutilized and vacant downtown properties by introducing new creative, dynamic, visually aesthetic installations and happenings downtown. The program was launched in August 2011 in response to District 1 City Councilman Diego Bernal’s desire to create a downtown environment rich in opportunities for locals and visitors alike to engage in cultural activities without needing to leave the heart of the city center. The storefront art also serves a dual purpose of promoting Councilman Bernal’s idea of downtown having lit and activated storefronts that create a safer environment for visitors and residents alike. X MARKS THE ART is no longer active. Please feel free to view past installations, and view an interactive map of where they were located.